Sister Marguerite Stanka, 100 years old and a Dominican Sister of San Rafael for 75 years, died peacefully at Our Lady of Lourdes Convent in San Rafael on August 25, 2018. Margaret Stanka was born in Michigan, the youngest of four daughters. She was just four years old when her father died, and the family relocated to the west coast. She attended grammar school in Alameda and graduated from Holy Names High School in Oakland. She was always an avid reader and knew from a young age that she wished to be a librarian. honor society, Pi Delta Phi. She earned her certification in librarianship a year later. Collection Development until she retired. with graduate courses for sisters and priests pursuing Master’s degrees. It was clear that a separate building was needed. Sister Marguerite worked closely with the architectural firm to plan the design of Archbishop Alemany Library, which opened in 1963 and anticipated growth of the student body as well as developments in library technology. In 1983, she turned her attention to ensuring the quality of the library collection. She retired in 1995 with the the title of Emerita, an honor given to faculty members who served the College with exceptional loyalty and devotion. The following year the library plaza was dedicated to Sister Marguerite. Sister Marguerite was preceded in death by her parents, and by her older sisters, Pauline, Florence and Martha. She is survived by many friends, former students and colleagues, and by her Dominican Sisters. The funeral Mass will take place on Friday, August 31 at 10:00 a.m. in the Gathering Space at Dominican Sisters Center, 1520 Grand Avenue in San Rafael. Sister Marguerite will be buried in St. Dominic Cemetery in Benicia on Tuesday, September 4 at 10:00 a.m.
Memorial gifts in honor of Sister Marguerite may be made to the Retirement Fund, Dominican Sisters of San Rafael, Development Office, 1520 Grand Avenue, San Rafael CA 94901. 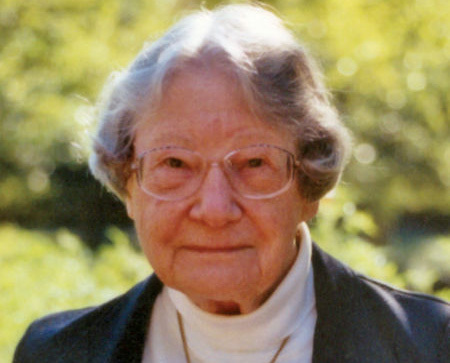 Reflection on Sr. Marguerite Stanka, O.P. By Sister Patricia Dougherty, O.P. We have just listened to the readings that Sr. Marguerite, a centenarian, chose for her funeral Mass. They are a bit heady and that they are is not a surprise to her friends. She was an intellectual who thought deeply about many things. She valued the life of the mind. In the gospel reading, St. John wrote, “In the beginning was the Word.” While we know that this is the Son of God and that there is deep revelation in the opening of John’s Gospel. It is also relevant to Sr. Marguerite’s life. Words were important to her, and she chose her words carefully. Words are contained in books, and she reverently cared for books for over 50 years. In addition, she read the Word of God daily and consumed it so as to share it. She loved liturgy and the office of the hours. According to John, it is the Word that brings light to the human race, the light that shines in the darkness. And isn’t this what the function of a library is on a college campus, a resource to shed light, to enlighten and to share the love of learning. Just picture Alemany library on its knoll, a building designed to incorporate natural light in its design. It is a testimony to the light in its structure and its contents. Expansive windows let the light in and let the reader look out on God’s creation of lawns, trees, flowers. Words are housed in the books in the building to be shared with people. Just think how many words are stored in the books in that library. And I wonder how many books Sr. Marguerite read in her life! Sr. Marguerite appeared to be staid, stern, and conservative and even perhaps a grand dame. She loved the panolply of colors and action of operas, the deep feelings stirred by classical music (such as Ravel’s Bolero), and the period dramas of Masterpiece Theatre. But she also watched the Kentucky Derby, the Incredible Hulk (a tv series about a man who turned into powerful green monster when emotionally stressed), and played cards (with a name I cannot divulge here). She was serious, but she knew how to have fun. 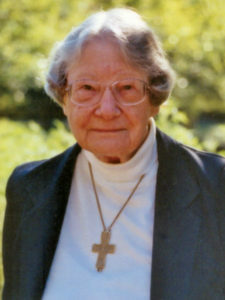 Sr. Marguerite had a prodigious memory and breadth of knowledge which she fed with books ranging from the mystic John of the Cross to the mystery writer Louise Penny. She could remember dates, and events and people –seemingly from any time in her past. If in doubt about dates, names, and facts about the college, one could always rely on Sr. Marguerite to provide an answer. She was a 19th century Luddite—that is a person who could not embrace technology. But when her eyesight deteriorated, she had to find another means to read books. It took her months just to open the package from the California Library for the Blind, but she was determined to feed her mind, and she learned how to operate and befriend two machines so that she could listen to talking books. In an 2016 interview with Dominic Study Committee, she imagined that St. Dominic would want Dominicans to understand and use technology creatively in preaching the Word. She valued technology even if she did not like it or learn much about it. April (as she was known to some of her friends) was an Anglophile. She loved English mysteries, English history, English Dominicans, English tea. One important event (Jubilee or birthday) was celebrated with a full-blown English tea with china cups and saucers, crustless little cucumber sandwiches and scones with strawberries and clotted cream. Oh, how she loved it! When traveling in the British Isles, she knocked at every Dominican place (like the Blackfriars), introduced herself, had a cup of tea, and shared a conversation. And she remembered the whole conversation forever. To college students at Edgehill, she recommended spiritual books by English Dominicans, Bede Jarrett and Gerald Vann. She treasured her picture with Timothy Radcliffe taken when he visited Santa Sabina. Her experience with these English Dominicans was an example of her unbounded love for all things Dominican. It was a privilege having Sr. Marguerite as a close friend for decades ( 4 or 5). She had a sense of history and valued it. We shared trips (to Oxford and Fanjeaux), meals, books, tough times, and joys. It was she who gave me the address of the Monastery of the Cross when I was headed for Paris in 1981 to conduct research for my dissertation. And that changed my life and the life of many in the congregation. The connection to our roots and these nuns has been a blessing. She was able to visit the Monastery with me on two separate occasions. In the past month, she turned to more spiritual reading (though there was always a good mystery available nearby). Sr. Marguerite asked one faithful visitor to read aloud an old book on meditation. The sister wondered: “Since I assume she was familiar with the book, I wondered if she selected the book for my benefit.” In the past month, she asked visitors what was their view of heaven. And I think her vision of heaven is what she is telling us in the readings she selected today. Paul wrote in his letter to the Colossians: “For in Christ all the fullness was pleased to dwell and through him to reconcile to himself all things.” And John: “We saw his glory, the glory as of the Father’s only Son, full of grace and truth.” She committed herself for over 75 years to the Word and to the Word made Flesh as a vowed Dominican Sister of San Rafael. And now she has entered into the fullness of life.